A woman takes in the magnificent scenery of Western Brook Pond in Newfoundland, Canada. A visitor to Gros Morne National Park stands upon a rock cliff overlooking the beautiful scenery of Western Brook Pond in Newfoundland, Canada. Western Brook Pond stretches for 16 kilometers along the mountain and glacier fjords and is some of the most stunning scenery in Newfoundland, Canada. 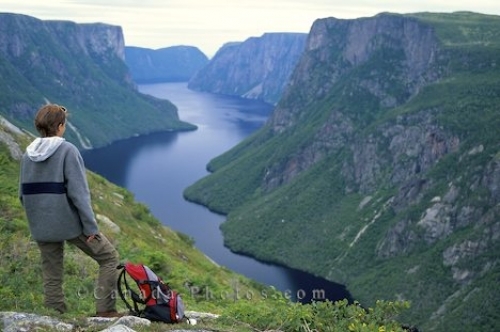 Photo of a tourist overlooking the beautiful scenery of Western Brook Pond in Newfoundland, Canada.